Premier Brisbane, Cali hotel and restaurant invite guests and locals to indulge in a gourmet Thanksgiving dinner without the hassle of cleaning dishes this November. DoubleTree by Hilton San Francisco Airport North welcomes guests and locals to Thanksgiving dinner at WhiteCaps Drinks + Eats this Thursday, November 24th, 2016. Diners may have their choice of the following: to start a choice Autumn Salad or Butternut Squash Soup, for the entrees a choice of either the Traditional Plate with dark and light turkey meat, mashed potatoes, sage stuffing along with honey glazed carrots, or Seared Salmon with a sweet chili glaze served along with marbled potatoes and haricot verts. For dessert a choice of either Pecan Pie or Pumpkin Cheesecake. This delicious dinner is only $28 per person, beginning at 11am through close. 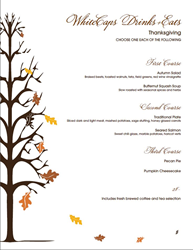 For more information or to book a Thanksgiving reservation, please call (415) 467-4400. DoubleTree by Hilton San Francisco Airport North, located minutes from the San Francisco Airport, boasts panoramic views of the beautiful San Francisco Bay and offers a prime location for travelers. A premier hotel offering free high-speed Internet, superior service, free parking, spacious rooms and suites, and a complimentary airport shuttle at the convenience of guests. The on-site restaurant, WhiteCaps Drinks + Eats offers guests a delectable taste of California cuisine. WhiteCaps Drinks + Eats welcomes guests to come for the drinks and stay for the eats. Offering globally inspired, regionally crafted, locally sourced cuisine with warm, attentive service, WhiteCaps Drinks + Eats’ Executive Chef Tristan Sheldon executes a fantastic blend of global flavors and techniques with the freshest local ingredients available. For more information on the DoubleTree by Hilton San Francisco Airport North, please visit http://www.doubletreesfo.com or call (415) 467-4400. DoubleTree by Hilton San Francisco Airport North and WhiteCaps Drinks + Eats are proudly managed by Stonebridge Companies in Denver, Colo.